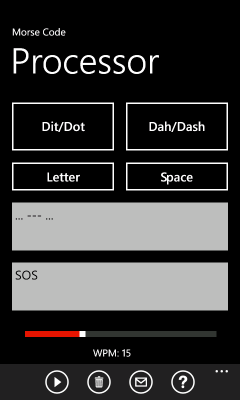 Generate International Morse Code using Dit/Dot and Dah/Dash buttons with real time translation. Playback the message as audio or send it as an SMS message. Adjust the playback speed from 1 to 50 WPM. Enter Morse Code using Dit and Dah paddles which will be translated directly into plain text. The Letter and Space buttons can be used to separate characters and letters respectively. Enter plain text and have it converted to Morse code. Playback the Morse code with adjustable WPM rate. 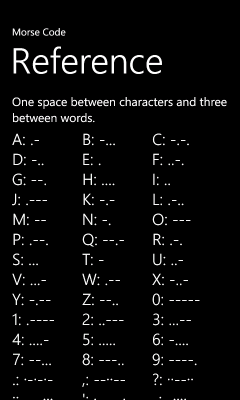 A reference page for Morse code characters. A Decoder function that will translate Morse code from the microphone.